This continues a trip we took from Joplin, MO to Los Angeles this past August. 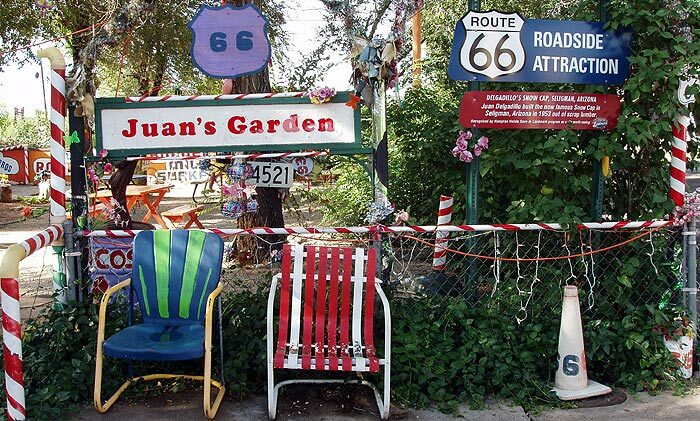 It was August 3rd; we had departed Williams, AZ with the goal of going as far west as we could that day. 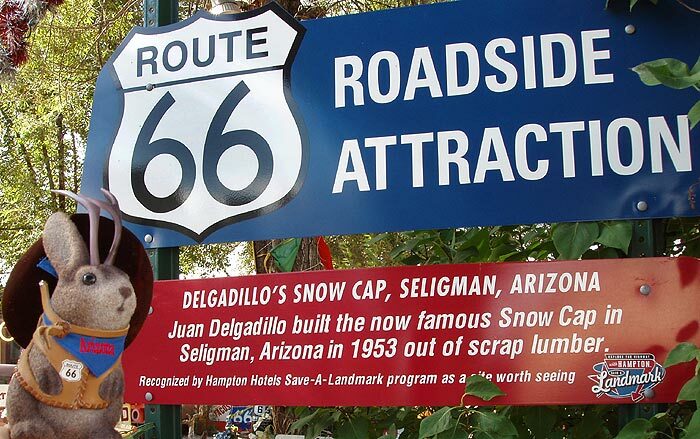 The first town at which we stopped was Seligman, Arizona, a pretty little place, where route 66 splits off from Hwy 40. 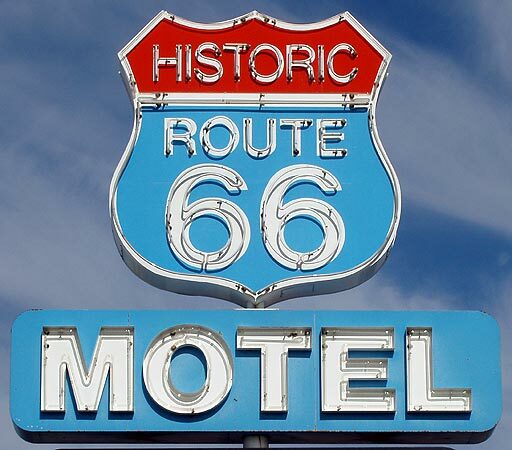 We took 66 through town, as I had only seen Seligman at night on previous trips. 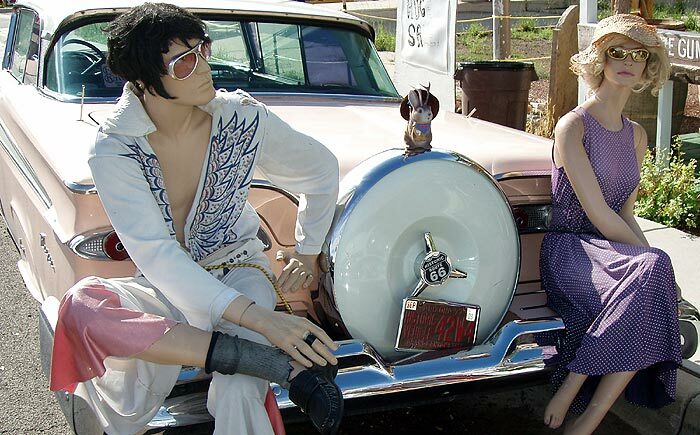 Mannequins, as a form of artistic expression, seem to be the popular along 66, as this strip mall exemplifies. 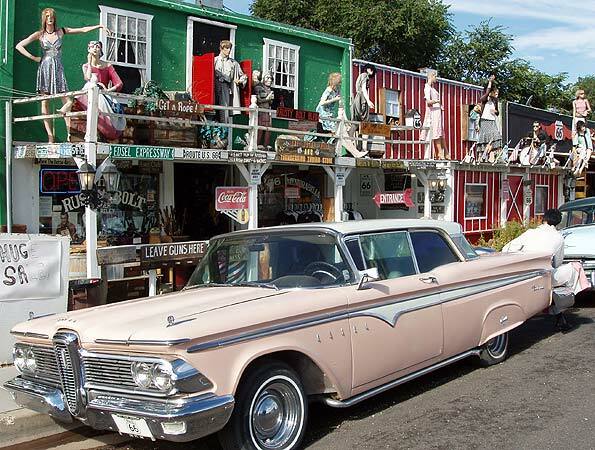 The owner apparently collects Edsels. 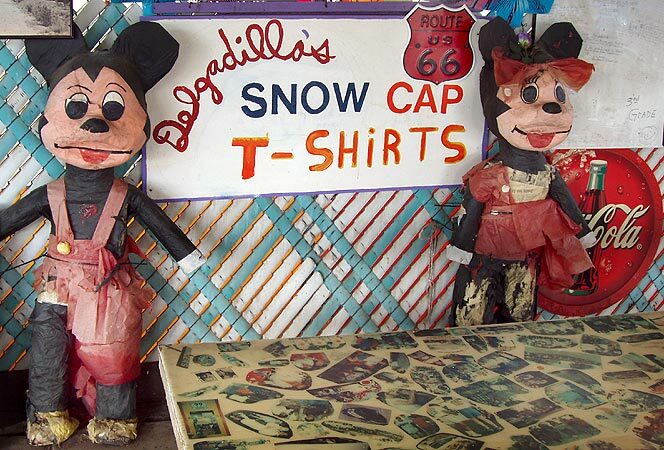 At the east end of town is Delgadillo's Snowcap, a drive-in with a sense of humor. 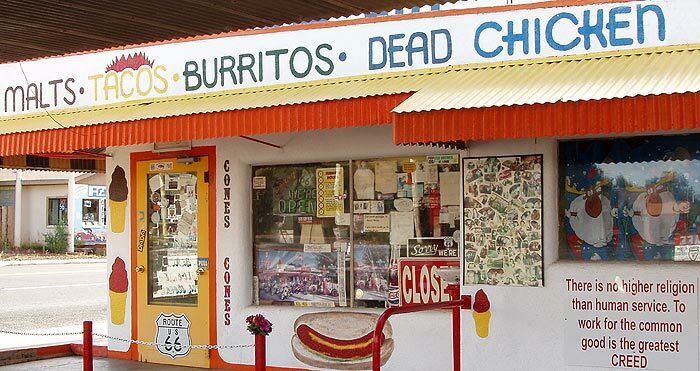 We had hoped to eat here, but were too early. 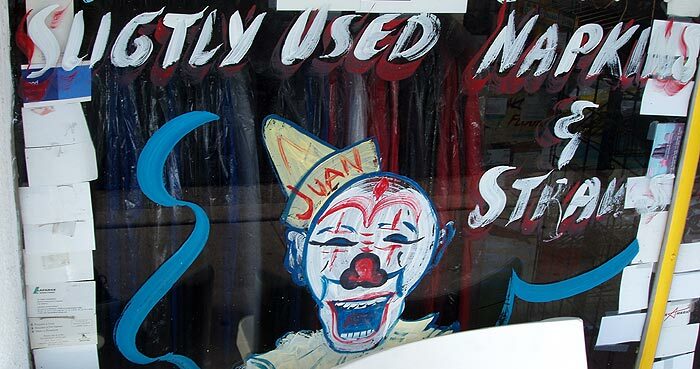 Sadly, Juan Delgadillo died last year. 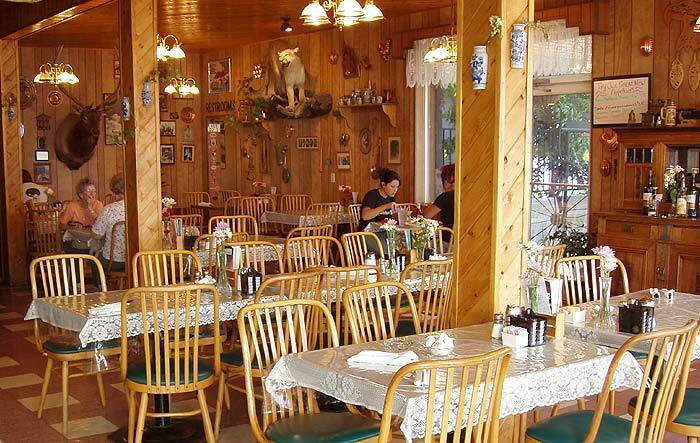 His son carries on the business, though, and the offbeat decor remains. 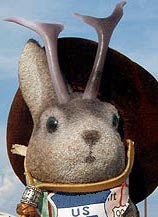 I wonder if Disney's attorneys know about this. 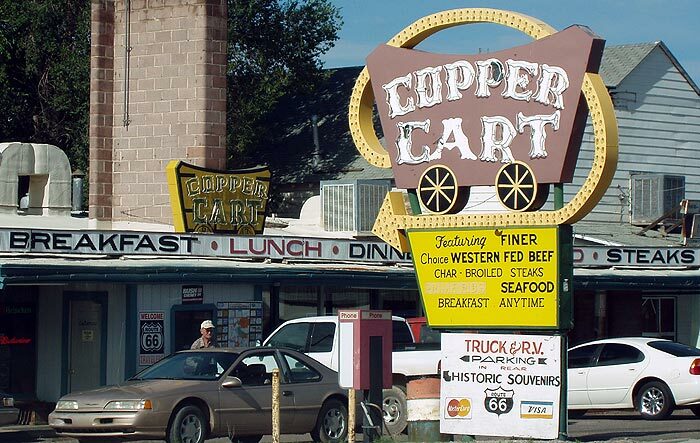 The Copper Cart is a restaurant with a cool sign. It wasn't open yet either. 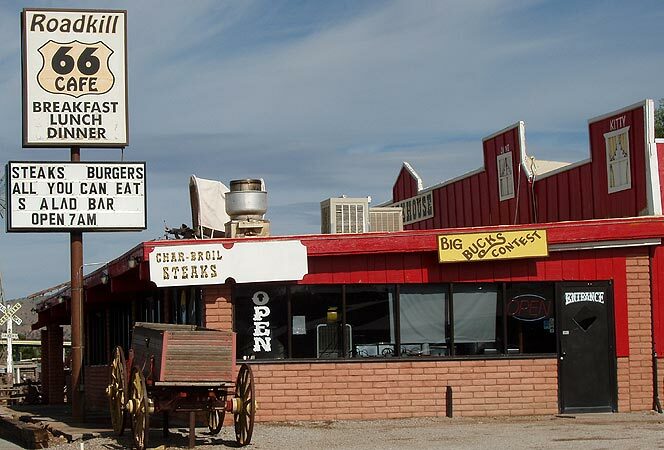 The Roadkill was open, but we didn't choose it; I loved the name, but last time I was through Seligman I witnessed the manager arguing with his employees outside and it didn't leave me with a good impression of the service. 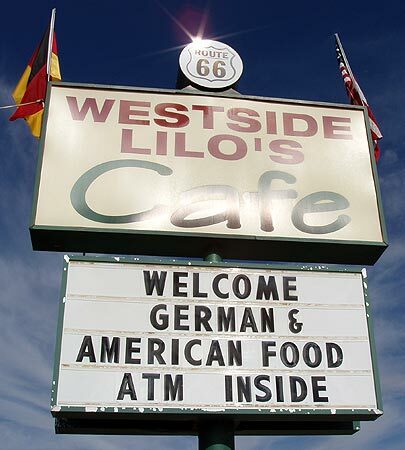 We finally ate at Westside Lilos. 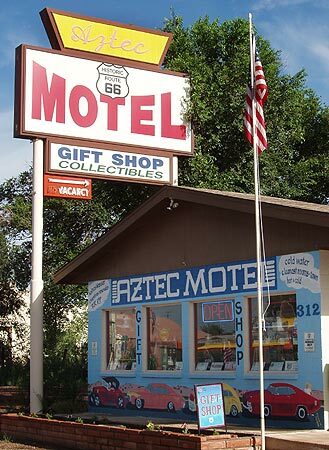 The exterior of the place was nothing unusual but the interior was decorated with quite a few Rt66 photos and memorabilia, including a really useful set of maps of Grand Canyon Caverns, a destination for a future trip. 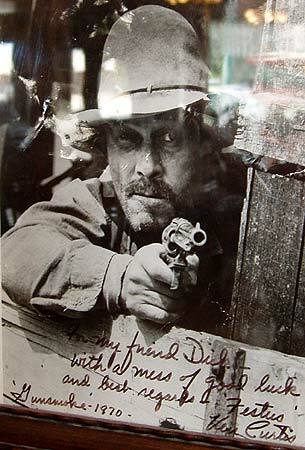 The classic TV buff in me was drawn to the autographed 1970 photo of Ken Curtis as Festus from Gunsmoke. 1970. 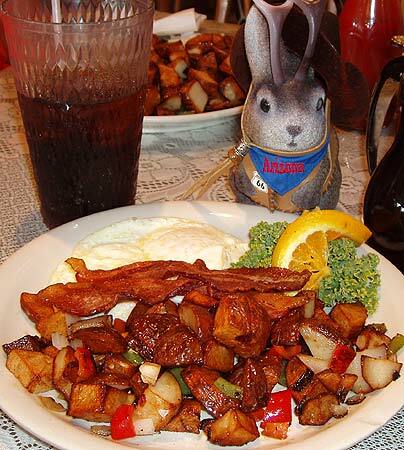 My breakfast wasn't bad at all. 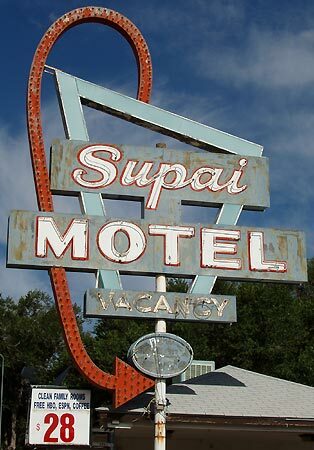 There are some nice motel signs in Seligman. 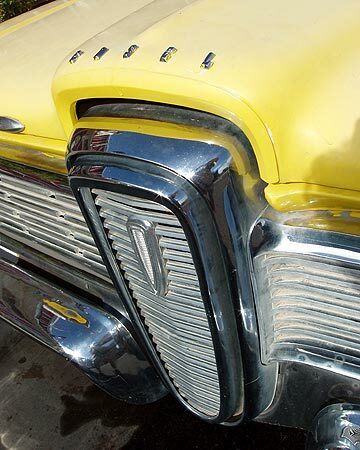 Nice googie touches here. You know why you should always take notes on a trip? 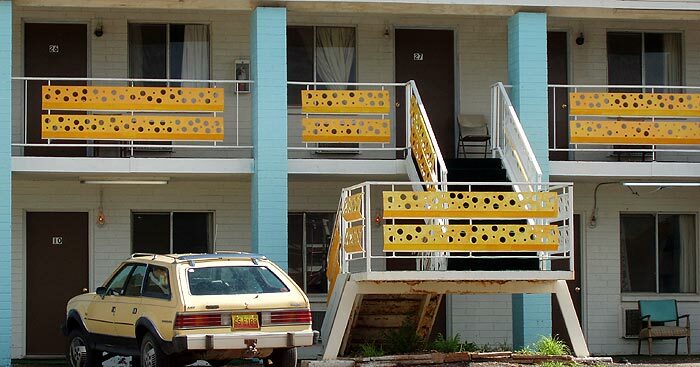 Because I don't know which motel this is. Ace does not know if it is actually cheese, and has decreed that I - his main driver, clothier and liaison to the world - must try to taste such cheese-suspect structures in the future. Great...it'll probably happen in winter and while I'm stuck to a cheesy building somewhere, he'll run off with the cheesecake.